This Fall Release there was a great deal of buzz surrounding K Vintners. Winemaker Charles Smith had recently been named Wine & Spirits magazine’s ‘Winemaker of the Year.’ Additionally, Fall Release Weekend marked the release of the 2006 Royal City Syrah – an effort Wine Enthusiast awarded a 100-point rating earlier in the year. This is a significant accomplishment with Quilceda Creek the only other Washington winery to ever receive a 100-point rating from any of the major publications. Not surprisingly, the celebration in Walla Walla was in full swing. 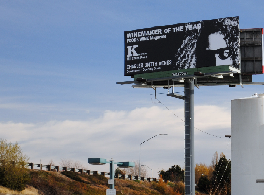 Highway 12 featured a billboard of Charles Smith’s face with the title ‘Winemaker of the Year.’ Many in town commented about the Rolls Royce Smith had been driving around town since receiving the award. As usual, K Vintners was releasing a dazzling number of new, small production wines. Unfortunately the winery was only pouring wines in the small front room of the winery (presumably the barrel room was still being used to ferment juice from the 2009 harvest). As a result, even with a small number of people, it was nearly impossible to get to the pouring tables. I decided to soldier on hoping to come back at a less crowded time but was unable to. My apologies to all. Rating: * (Excellent) Pale yellow. Mineral, peaches, and honeysuckle on an aromatic nose. Very evenly balanced on the taste. 100% Viognier. Archie den Hoed Vineyard Block 13 (Yakima Valley). Barrel fermented in neutral French oak. 14.1% alcohol. Approximately 1,000 cases produced. Sampled at 55 degrees. Rating: + (Good) An exciting nose marked by olive, meat, red fruit, and herbal aromas. Taste doesn’t quite live up to all that the nose promises but a very enjoyable wine for the money. 100% Syrah. Sundance and Pheasant vineyards (Wahluke Slope). Aged in French Burgundy barrels. 13.9% alcohol. 1,396 cases produced. It is nice to read you comments on the Milbrandt Syrah. I just posted a review of it on my site, along with an interesting little experience. I hope Charles is pouring at Taste WA on Sunday. He is always a memorable character to talk to. Hopefully I will bump into you this weekend. Hi Melinda, thanks for the comment. Indeed, Mr. Smith is always memorable as are his wines! Hope to see you this weekend.